Moderator Ryan Arsenault (right) speaking with lecturer Thomas Moran (left). This seminar is the third and final installment of the One Health seminars for this semester. One Health is an interdisciplinary concept that attempts to show how humans, plants and the environment are interconnected. 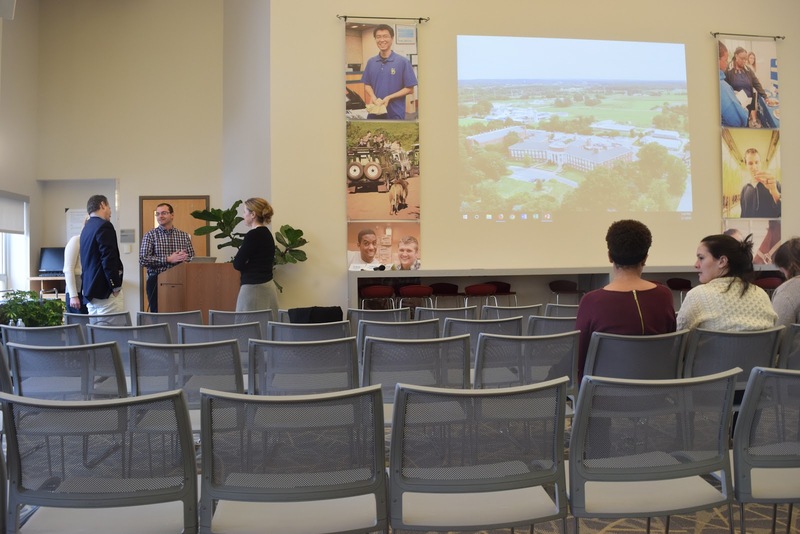 An employee for the Delaware Division of Fish & Wildlife (DFW) told students and faculty at a One Health seminar Friday that mosquitoes are capable of causing serious diseases and, as of right now, not much can be done to stop them. 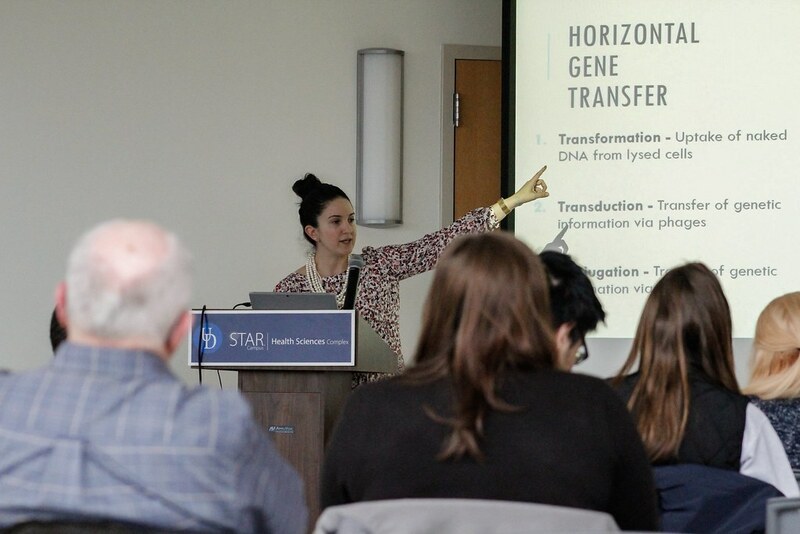 This One Health seminar took place at the STAR Health Sciences Complex. The speaker, Thomas Moran, who works for the mosquito control division of the DFW, said that mosquitoes are tiny insects, yet are capable of killing humans. “People don’t want to live in areas where lots of mosquitos live,” he said. Mosquitoes are typically just a seasonal nuisance. They bite and leave itchy spots that swell a bit, but Moran told the audience that mosquitoes are more than just nuisances. They are a risk to public health and safety. Moran opened up his presentation with a chart from Gatesnotes, the official blog of Microsoft founder Bill Gates. The chart showed the number of human deaths attributed to various animals, including humans murdering each other. Mosquitoes topped the chart, killing about 725,000 people per year. Sharks and crocodiles, both of which are territorial animals and known to be violent on occasion, kill 10 and 1,000 people per year respectively. One of America’s earliest experiences with mosquito-borne diseases was yellow fever. Because of the European slave trade, yellow fever ended up in the Caribbean, particularly in Haiti and Cuba. During the 1791 Haitian Revolution, Napoleon attempted to reclaim Hispaniola, which would eventually become Haiti and the Dominican Republic. About 20,000 French soldiers died because of yellow fever. France brought yellow fever to the their land in central North America, land which they later sold to the United States in the Louisiana Purchase. “The Louisiana Purchase was due in part to the tiny mosquito,” Moran said, referring to the problems France suffered in Haiti. The problem is mosquito-borne diseases never went away. One of the most recent is the Zika virus. Zika virus is a usually non-fatal mosquito-borne virus that became well-known in 2015 for causing many birth defects in the fetuses of pregnant women. The most common of which was microcephaly, a disorder in which which the brain and skull do not fully develop, leading to neurological disabilities. According to Moran, Zika is typically common in South America, especially in rural areas where citizens do not regularly have access to air conditioning, window screening and water sanitation. To make matters worse, the mosquitoes that cause Zika are unusual in that they will actively seek out homes and backyards to feed on human blood. Scientists have tried to curb the mosquito population with mixed results. Paul Hermann Müller was a Swiss chemist best known for creating DDT, a synthetic insecticide, for which he won the 1948 Nobel Prize in Physiology or Medicine. DDT was used to kill mosquitoes and other pests. It worked, but it worked too well. “Silent Spring” by American marine biologist, Rachel Carson, explains in detail all the problems that DDT caused, including killing predators in the food chain. The EPA banned DDT in 1972 due, in part, to Carson’s book. Moran’s current work tries to find new ways to control the mosquito population. Moran said that of the 57 species of mosquitoes in Delaware, only 19 are pestiferous, or disease-carrying. Part of Moran’s job is to study these mosquitoes to determine where they live, what organisms they typically prey on and whether they are nocturnal. Because Delaware is the sixth most densely-populated state and beacuse about 25% of its water area is wetlands, the state is a prime habitat for mosquitoes. Typically, Moran will set traps for mosquitoes that are baited with dry ice and a 20-watt light bulb because mosquitoes are attracted to both sources. “There’s no magic bullet to mosquito control,” Moran said. Another one of his projects is introducing mosquitofish, a small silver fish that eats mosquitoes, into the insects’ habitats to curb their population. This is done by diverting the flow of ponds so the fish can reach the mosquito-laden areas. Moran also referred to what he called “Frankensketeers.” These creatures are genetically engineered male mosquitoes that breed with females to create sterile mosquitoes without the gene that causes these diseases. It is a way to decrease the mosquito population without harming the environment like DDT did. Scientists have not yet found the most effective way of dealing with mosquitoes. For now, it is just up to the discretion of experts to figure out the best option for each situation. Introducing birds and bats would help, but the extent to which they help would be negligible at best. This article is the second part of a series of seminars devoted to One Health. A group of scientists told students at a seminar in Townsend Hall that the flu is more complicated than they think.